Posted By:Unknown | At:5:09 PM Be the first to comment! WASHINGTON -- Michelle Obama will speak at three college graduation ceremonies this spring, including two in key general election battleground states. Mrs. Obama's first commencement address will be at Virginia Tech. The White House says the first lady has been inspired by the school's resiliency following the deadly 2007 campus shootings. Mrs. Obama will also speak at North Carolina A&T, a historically black university. Virginia and North Carolina are both politically important states that will be crucial to President Barack Obama's reelection prospects. 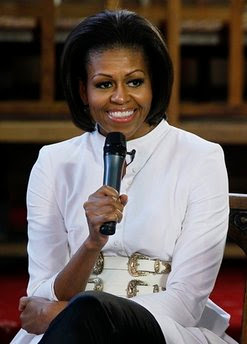 Mrs. Obama will also deliver the commencement address at Oregon State University, which has been recognized for its efforts to promote healthy communities, a key priority of the first lady. Mrs. Obama's brother, Craig Robinson, is the coach of the school's men's basketball team.